Take advantage of Memorial Day savings - up to 30% - with Promo Code: MEMDAY18. See list of wine suggestions for under $20 here. HELP BRING FREE MUSIC PROGRAMS TO PUBLIC SCHOOLS during National Music in Our Schools Month. For Every Bottle of LVE wine You Purchase in March, You Give $2 to MUSIC UNITES, the leading non-profit charity organization supporting music education around the world. SUPPORT NOW. BUY A BOTTLE OF LVE. It’s the perfect pairing. LVE wines were inspired by harmony. Created by Grammy Award Winning Singer/Songwriter John Legend, LVE wines are the expression of passion, eloquence and Napa Valley Tradition. A unique series of rich, soulful and complex notes inspired by true love and produced in collaboration with Raymond Vineyards, an iconic brand known for Cabernet Sauvignon in the Napa Valley. MiShawn Williams of VinoVie is an Independent Wine Ambassador with Boisset Collection, the international, eco-elegant wine company behind this harmonious collaboration between Raymond Vineyards and John Legend. She will personally donate $2 from each bottle sold to Music Unites. Feel Bubbly with our Sparkling Wine Sale! Enjoy magnificent French Champagnes, Burgundy Crémants and California Sparkling wines in time for New Years! 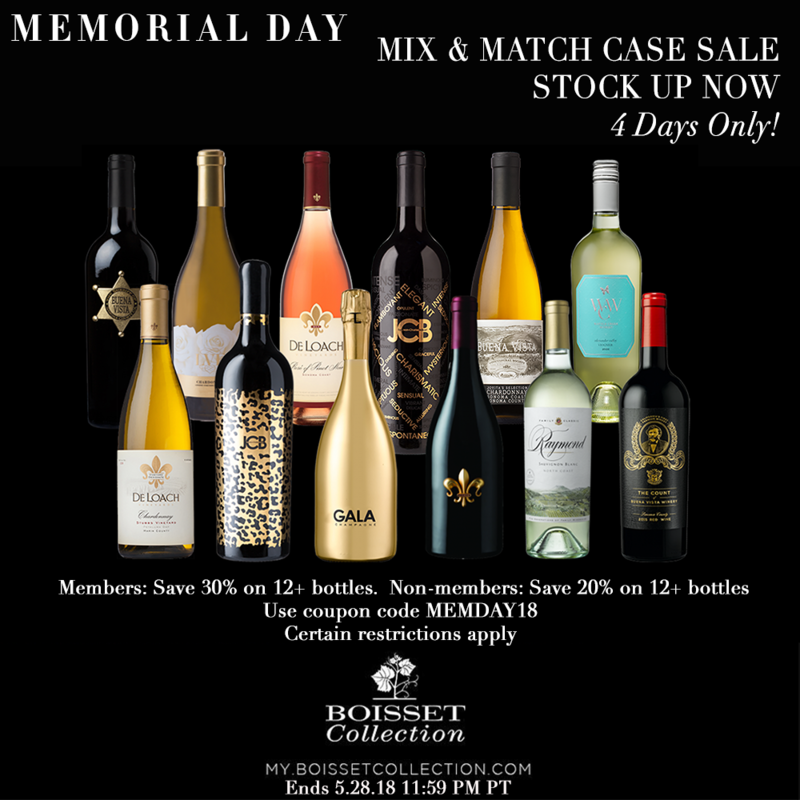 Wine Society members enjoy 25% SAVINGS on 6-11 bottles or enjoy 30% SAVINGS on 12 + bottles. Mix & match. Non-members enjoy 10% SAVINGS on 6 bottles or enjoy 20% SAVINGS on 12 bottles. Mix & match. The fires of the last week in Napa and Sonoma have been categorized as the worst in California history. One of the things that made it so scary and devastating was the surprise of it. Many people were evacuated or had to flee from their home in a matter of minutes. Fortunately, our family of Boisset Collection wineries are still standing with Raymond and DeLoach open for tasting this week. Unfortunately, with a heavy heart, some of our winery staff, both current and past, have lost everything. It's shocking and heartbreaking; however, the winery community is coming together in so many ways to support each other. Once again, we are inspired by the generosity of our wine community, friends and family, and the outpouring of support. For our employees that have been affected, we have established a Go-Fund-Me campaign to help them get back on their feet, with Boisset matching employee contributions up to $25,000. To love, passion and friendship…. And to a strong, resilient, and ever-hopeful wine country! To learn more about the status of the fires and to hear directly from Jean-Charles regarding the impact and our forward-looking future, see the video that aired on PBS. I love this recipe for a Spooky Sangria just in time for Halloween. The key is making it a deep red color and all of the fun, spooky additions that give it more of a Halloween flare. Our DeLoach Zinfandel and the Buena Vista "The Count" are perfect red wines for this cooky concoction. Don't forget the gummi worms!. Add the ginger ale or club soda, grenadine syrup, ice, and creepy candy just before serving. * For the deepest red wine color, choose a Cabernet Sauvignon, Merlot, Rioja red, Zinfandel, or Shiraz. If you'd like to serve the Halloween Sangria right away, use chilled red wine and serve it over lots of ice. Halloween is the one holiday of the year where anything goes. Sangria fits perfectly because there are no rules to sangria either. Have fun and use your imagination to add creepy elements to your punch bowl. Freeze plastic spiders and other cheap, spooky toys in ice cube trays. Half way through the freeze, add a dash or two of red food coloring or grenadine to each cube. Add fresh fruit to the punch or ice cubes. Sliced strawberries, peaches, kiwi, or a handful of fresh blueberries and raspberries are all fun options. The bigger variety of fruit, the better as it looks like a witch's brew. Edible eyeballs are always a fun addition to a Halloween drink. Olives are the easiest 'eyeballs' though you can build your own with fruits like lychees and blueberries. Float them on top or freeze them in ice. Add black plastic spider rings to the stem of the wine glasses to complete the Halloween effect. Do you want your Halloween Sangria to be just a little stronger? Add a shot or two of gin, brandy, or rum. Don't get too crazy on the booze, though. You don't want all your ghostly guests to become zombies before the night's over.